Due to his impatience, Arjuna was unable to stay on the battlefield, and he was forgetting himself on account of this weakness of his mind. Excessive attachment for material things puts a man in such a bewildering condition of existence. Bhayam dvitiyabhinivesatah syat (Bhag. 11.2.37): such fearfulness and loss of mental equilibrium take place in persons who are too affected by material conditions. 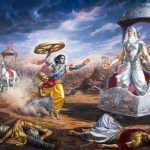 Arjuna envisioned only painful reverses in the battlefield—he would not be happy even by gaining victory over the foe. The words nimittani viparitani are significant. When a man sees only frustration in his expectations, he thinks, “Why am I here?” Everyone is interested in himself and his own welfare. No one is interested in the Supreme Self. 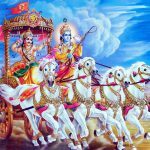 Arjuna is showing ignorance of his real self-interest by Krishna’s will. 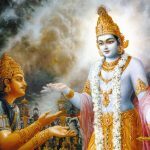 One’s real self-interest lies in Vishnu, or Krishna. The conditioned soul forgets this, and therefore suffers material pains. Arjuna thought that his victory in the battle would only be a cause of lamentation for him. Nimitta is used in the sense of “end result”, just as the goal of money is a good residence. I will not get happiness by attaining the kingdom if I win the war, but rather will suffer sorrow, the opposite result. 1.30 Sri Sankaracharya did not comment on this sloka. The commentary starts from 2.10. 1.30 – 1.34 Na ca sreyah, etc., upto mahikrte. Those who are wrongly conceived as object of slaying, with the individualizing idea that ‘these are my teachers etc.’8 would necessarily generate sin. Similarly, the act of slaying even of those deserving to be slain in the battle-if undertaken with the idea that ‘This battle is to be fought for the apparent results like pleasures, happiness etc.’- then it generates sin necessarily. 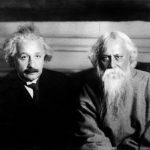 This idea lurks in the objection [of Arjuna]. 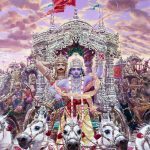 That is why a reply is going to be given [by Bhagavat] as ‘You must undertake actions simply as your own duty, and not with an individualizing idea. na — nor; ca — also; śaknomi — am I able; avasthātum — to stay; bhramati — forgetting; iva — as; ca — and; me — my; manaḥ — mind; nimittāni — causes; ca — also; paśyāmi — I see; viparītāni — just the opposite; keśava — O killer of the demon Keśī (Kṛṣṇa).